(SPOILERS) Neill Blomkamp scarcely needed anyone else voting against him self-penning his own movies after the underwhelming Elysium. But, just in case anyone was on the fence, he has ollowed it up with phenomenally misconceived Chappie, a picture so fascinatingly bad, so inept on every level (barring effects and action direction, both rendered with typically deceptive ease) that one is baffled Fox would be willing to hand him the keys to the Alien franchise. I mean, let Blomkamp direct an Alien movie by all means but he shouldn’t be let near a typewriter ever again. This isn’t the first time a multi-hyphenate “auteur” has been unleashed on the all-conquering xenomorph. The last time was a decade ago when Paul W S Anderson, the legend in charge of the Resident Evil series, took it upon himself to match aliens against predators. I can give Elysium a bit of slack; I mean, it was clunkingly obvious and crude in its storytelling and logic, but its heart was in the right place. Pretty much. What Chappie is trying to say is a mystery. On the one hand it’s the tale of an E.T. like innocent in Robocop form, a child A.I. brought up as a gangsta rapper by Die Antwoord (white South African rap-ravers Ninja and Yo-Lande Visser, playing themselves for reasons unclear – possibly the way Norman Wisdom always plays “Norman” – and excruciatingly providing soundtrack accompaniment too; one can only guess the latter came free, or they paid Blomkamp). On the other it’s a glorification of Johannesburg guns-and-ganster culture; our murderous protagonists are apparently to be rooted for and, even though Ninja’s a complete prick, he’s still Chappie’s “daddy” (I may have missed something, but I don’t get why we’re supposed to treat them like Ocean’s 11-type likeable felons). The corporate side is absolute nonsense; so much of this movie teeters on the brink of self-parody, you only wish there was actually a sense of humour involved (at one point Yo-Landi is in bed with Chappie, Morecambe and Wise style, but it’s left at that). Deon (Dev Patel, pouring milk on his cardboard) has come up with the robot cop A.I. programme, much to the chagrin of Vincent Moore (Hugh Jackman, who I’m guessing took the part solely to sport a ridiculous mullet and short shorts), whose Moose programme (ED209, basically) is rejected by CEO Michelle Bradley (Sigourney Weaver, in the second successive case of Blomkamp getting a great actress and furnishing her with a lousy role). Nothing about this office environment makes any sense. That Deon isn’t on the board after creating a smash hit robot police force, that Vincent is able to get up to no good at every turn (don’t they have an HR Department? ), that Michelle is so hopelessly short-sighted she can’t perceive of any uses for either Vincent’s metal mammoth or, most nonsensically, Deon’s revelation that he really has created A.I. (“You’ve pitched me a robot that can write poems” she says, waving him away). She’s a moron. Then there’s the strange anti-Robocop ethos running through the set-up, which is contrary to about 90% of such fare that puts humanity first; Vincent’s design has a human operator (it’s like a Jaeger!) but he’s the bad guy. It’s the guy behind the autonomous killing machine who’s right (although only so much, Deon is a nerdy square, which means he can’t ever be up there with Chappie’s surrogate mommy and daddy, Die Antwoord). This kind of backward logic reaches its most absurd extreme during the climax, in which – clearly forsaking any last vestiges of plausibility – Chappie uploads the dying Deon into the body of another robot. How does Deon react? He doesn’t bat a metal eyelid. This, despite the rational approach seen in the Robocop series (including the remake), that messing with one’s flesh and blood self would have untold psychological consequences (if you didn’t just plain lose it). I don’t know, perhaps the He-Man reference is supposed to indicate the level of internal logic Blomkamp is working by, but even by Masters of the Universe standards this doesn’t make a lick of sense. Die Antwoord decide to abduct Deon because he must have a remote control to turn the robots off? It’s like this has been scripted for the Children’s Film Foundation, just with added dismemberments. At one point Ninja leaves Chappie in a rough neighbourhood to fend for himself and learn it’s a hard world. It doesn’t compute, particularly since Chappie barely makes it back and the robot is crucial for Ninja to pull off his robbery. 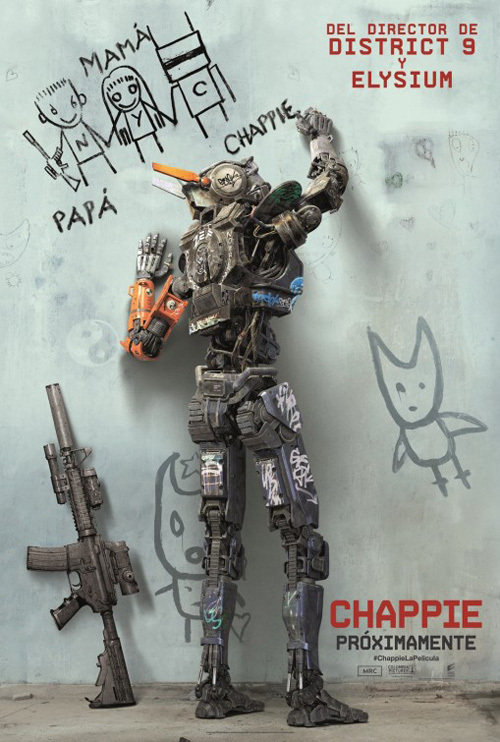 None of this might be so bad if Chappie was an endearing and loveable creation. He isn’t; he’s plain annoying (as motion captured and voiced by Sharlto Copley, never backwards in drawing attention to himself), be it playing the frightened infant or strutting gangsta poses; he’s only palatable during the opening section when offering more Robocop-esque delivery. Blomkamp seems (I emphasise seems, as what the hell he’s up to is probably known only to him for certain) to be saying something about our freedom or lack thereof to be who we need to be, with the good and bad fathers (Ninja and Deon, but which is which?) pulling him in every which way to get what they want (Deon tells Chappie to nurture his creativity, not to kill, and to be himself, then starts dictating what he has to do). At the end, Yolandi’s consciousness is ready to be downloaded into a new robot form, a triumph for machines over flesh, and there isn’t the slightest doubt that she is to be rewarded for… being a good mother? Ninja and Yo-Landi are both terrible, as if that needs saying. The former comes across as a particularly inept Albert Steptoe, just a tattooed version with designs on being a gangster. The latter, an excitable eight year old in an adult’s body with a voice to match, is just very odd, and intensely irritating. God knows what Jackman’s doing in this, although he does get to deliver the one funny line (“Come on, you little gangster!” Vincent gloats as he deals destruction via the Moose bot). The effects are impressive, of course, and Blomkamp can be relied upon to deliver a sterling bit of action; there’s a freeway heist, the Moose on the rampage, and a final sequence where Chappie gets angry, lifted straight out of Murphy arresting Clarence Boddicker. His design, complete with ears, reminded me a bit of Green Rabbit from the Marvel Star Wars comics. Well, just the ears really. Apparently Blomkamp has two sequels in mind, but it’s probably safe to say (I hope so, anyway) that they’re as likely as his District 9 sequel. I really hope someone rewrites whatever gubbins he’s come up with for Alien 5 but given Sir Ridley’s rewrite input on Prometheus was less than reassuring, he probably thinks its dynamite stuff. Make no mistake, Chappie’s a bad movie, but it’s an expertly made bad movie, and its sort of hypnotic for how overwhelmingly bad it is. Meanwhile, if you want to see a half decent recent A.I. movie, you could do worse than check out Automata.